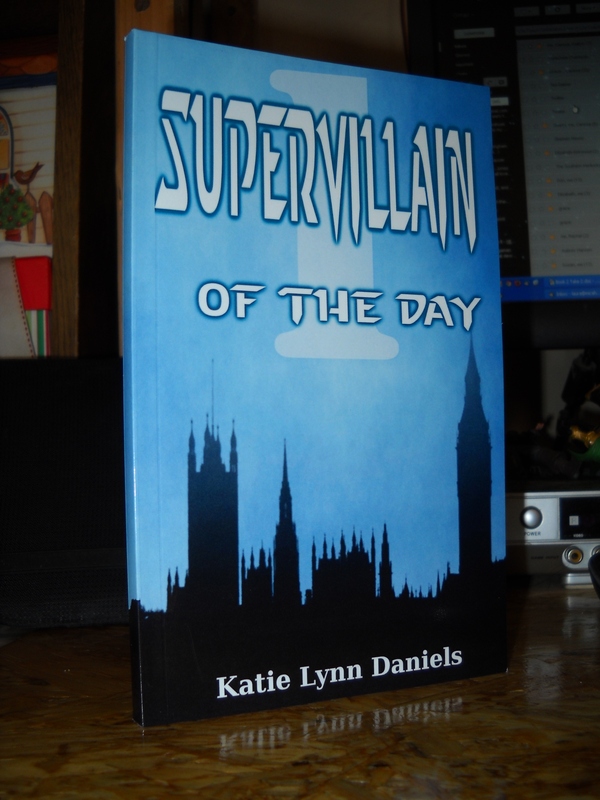 The proof copies for Supervillain of the Day came today. It’s very exciting. They’re shiny and blue and shiny and… yeah. I like shiny. It’s an author thing. Anyway. What this means is that the book is almost done. And it’s getting very close to release date. We found a couple of odd typos which need fixing, but the Library of Congress Control Number came today too, so any day now it will be pronounced done. Would you like to own your very own copy of this pretty shiny thing? Really? There’s a preorder button floating around now. You can have the book, and my signature and get the thing mailed on January 1st for only $5.99! And did I mention free shipping? Floyd: The release date is supposedly January 1st. How can you ship it then if it’s not available before then? Ignore him. Press this shiny button here, and enter the adventure. Floyd: That’s a really lame line, you know that? Lamest sales line ever. ‘Enter the adventure’? Really? How overdone is that? Will you shut up already? No one asked you. Floyd: Yeah, but I want to talk about the apocalypse and you’re hogging the post. Hogging the- Floyd, you can’t hog a post. There’s plenty of post. There’s plenty of room. There are whole other posts you can have! Floyd: So shut up already and let me talk. All right! Fine! We now come to the part of the post where Floyd talks about the Apocalypse. As you know, the apocalypse is coming. Today, in fact, or so I am informed. I don’t know what the rest of you are expecting–zombies, global warming, nuclear war or something like that. And frankly, I don’t care. Because you’re all wrong. What zombie invasion could possibly compare to the truth–that we’re about to face a supervillain invasion? Katie: Who sounds like a bad television commercial now? Katie: You interrupted me, so I get to interrupt you. Katie: Should have thought of that before you started interrupting, buster. It may not be the end of the world, but it will be the end of the world as you know it. Some of you have already experience the effects that this takeover will have but soon the world will feel their power. And what are you going to do about it? Katie: You know you want to. The bottom line is that the Mayans were right. The end of the world is coming, and you had better be ready to stop it. Floyd: It was your fault. Katie: My fault? How was it my fault? Floyd: You’re the one who thought it would be a good idea to put two blog posts into one! Katie: You’re the one who wouldn’t stop interrupting. Floyd: You were taking too long! Katie: Taking too long? Let’s get out a word counter and see who has the most words. Would you like that? Katie: You concede that I’m right? Floyd: No, I just think we should stop arguing and publish this post before the Apocalypse ends without us. Katie: Oh, right. I didn’t realize we hadn’t done that yet.